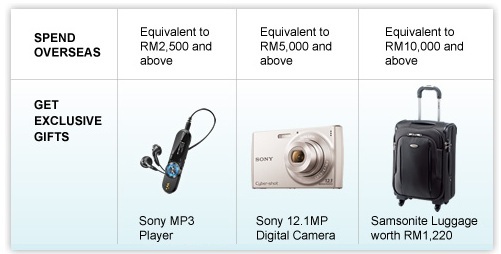 Citibank VISA Credit Cards - From 1 Dec 2011 till 29 Feb 2012, get guaranteed* gifts when you spend anywhere overseas. Start making your trips even more memorable exclusively with Citibank. Players, 1,000 units of Sony Digital Cameras and 500 units of Samsonite Luggage. Valid only for Citibank VISA Credit Cards. Each participant is entitled to receive one (1) gift only.